While most moles are harmless, there are some that may need to be removed. There are cases where the location of the mole may necessitate removal. Some moles that are harmful or potentially cancerous should be removed. When a sharp object cuts the skin causing a jagged, dirty and bleeding wound, it is known as a laceration. Severe lacerations that are ¼ inch deep or more exposes internal tissues and may cause an unsightly scar. Lacerations of this severity should be seen by Dr. Ward. An ingrown toenail is a painful condition in which the corner or side of a toenail grows into the soft tissue. 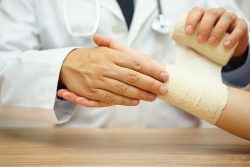 There are precautionary ways to prevent infection and discomfort but if pain persists, Dr. Ward may trim or remove the toenail to treat the condition. 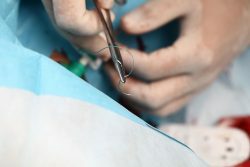 Pressure and puss buildup under the skin due to a boil or abscess may require a minor surgical procedure called incision and drainage. In some cases, to relieve the pressure, Dr. Ward will make a small incision in the skin which will allow the puss to drain. This will relieve the pressure and heal the area.